Another update! And it's the end of this story! Okay, no incredibly long Bible lesson today, but I do have a ministry update, a praise. I meant to mention this last time, but I became too long winded. A ex-coworker friend of mine (he was transferred to a different location with the company), who I had been witnessing to and praying for, called me up on the 15th just to let me know that the Holy Spirit lead him to call me and tell me that the Spirit's been leading him into the Bible and he's been really learning a lot and still working on things. What he didn't know is that I was having a bad morning and I often feel like my efforts for the Lord are in vain. However, it was a real blessing and encouragement to me to hear from him about how the Lord is working in his life! And I hope it encourages you all as well! I'm not sure when more Gospelman comics will appear online, but pray for me please that I will be able to find the time and inspiration to make them! Lord willing! And, in other news, I've started on a Gospelman video game in the way of one of my favorite genre, the Point and Click Adventure Game! Like Curse of Monkey Island or Sam and Max Hit the Road or Full Throttle (which I haven't played, but the graphics look awesome). Yep. Using my years of college training in animation and video game design, it's going to be a fully hand-drawn, 2D animated adventure game! Also, I thought it was the best genre for the character. Anyway, the game will probably be years in development, so we'll see. I'll give updates sparingly and only when updates exist. Right now I'm still developing the game on paper, although I have purchased the Game Maker Studio Professional software and have been watching tutorials. I've piddled in Adventure Game Studio for years, but thought it best to use GMS, which I felt the Lord lead me to. In the meantime, feel free to send in any fan art or fan mail to GospelmanMinistries@Gmail.com. We need them for the first printed issue, coming out soon, as well as other future issues. I think it's really corny, but I like that, so it's fun. Batman as rabbit man... bat for rabbit... funny. Salvation makes Superhero choices. I really like it. Goodnews Nephew.. ne(phe)ws... there's a lot of jokes and I don't even know how many of them were intentional. When you find some inspiration, you should really get back to it. Maybe I'll do a picture on the kids in the corners... I noticed you subscribed... though I'm not sure when. Yeah, originally Gospelman was meant for younger readers, but later I wanted to focus more on young adults or teens because people told me I couldn't dig in deep to Biblical lessons because little kids wouldn't understand anything past Veggie Tales doctrine. 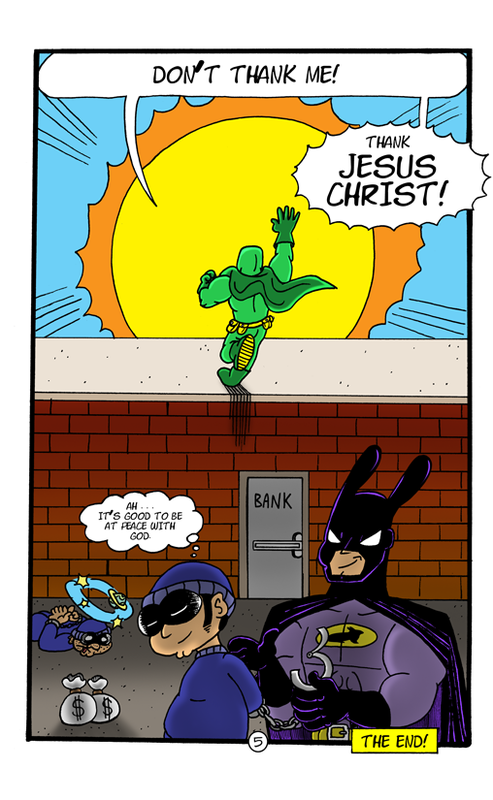 I'm a comedic cartoonist and originally Adam West's 1966 Batman was inspiration to set the mood for Gospelman. Trust me, it's probably intentional humor. I originally wanted Goodnews Boy to be called Bible Boy, but I was afraid that the Bibleman series (which I actually didn't know existed when I created Gospelman) already had a character by that name. After more research, I discovered that's not true, so I've changed the pages back to "Bible Boy" or "Bibleboy." But, yeah, there's this whole backstory where Cody loses his mother and Ted, an unsaved man who now is forced to raise Cody, is angry with God but ultimately comes to accept Christ as Savior... So, yeah, Cody is his nephew. Yeah, I subscribed to every Christian webcomic as a way to help spread the word that Gospelman was online here (I did read your Kids in the Corner webcomic/images though as it was short, if I remember correctly). There's also a Family Circus style (single panel) strip version on comic fury too if you go looking for it. I've been very busy lately and haven't been able to draw or write much. Just got called into work on my day off and gotta head out. I also do (did) the webcomic at www.MiloComics.com and Hip Hop with Empire Comics Lab publishing company at www.EmpireComicsLab.com, if you want to see my other works. I'm hoping to improve the quality of Gospelman as the story progresses, as it does come off as very corny.